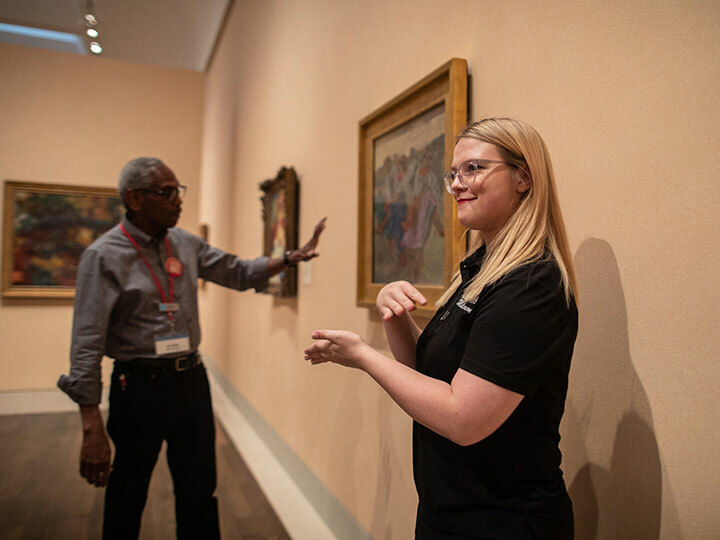 The American Sign Language Interpreting (ASLI) Program at the UH College of Liberal Arts and Social Sciences (CLASS) is proud to join forces with the Museum of Fine Arts, Houston (MFAH) in creating an accessible museum experience for visitors in need of sign-language interpreters. On Saturday, March 30, seniors in the ASLI undergraduate program will volunteer at the museum, serving as interpreters for docent-led tours. ASLI Undergraduate Program Coordinator Sharon G. Hill has been instrumental in making this groundbreaking accessibility effort a reality. The MFAH invites guests to celebrate Vincent Van Gogh’s birthday and “solve an art mystery” by collecting clues from docents and ASL student interpreters. Some interpreters will be paired with docents, while others will be stationed in designated locations near selected pieces of art. Upon arriving, members of the deaf community will receive a special map of these stations so that they can receive information about the art on display as they make their way through the galleries. In addition to the interpreter services offered by senior-level students, junior-level students will be on hand to greet visitors and run an informational booth on deaf awareness. The entire booth experience will be conducted in sign language, creating an immersive experience for those who have never interacted with a deaf person or had to communicate without verbal or auditory input. Hill is pleased that the MFAH and the ASLI Program have made the museum more accessible than ever to the deaf community.